With its 'Bee Man' sculpture and a bee incorporated in the town crest, it may be popularly believed that the origin of the name has something to do with apiculture. he name, however, actually derives from the saxon "beos-tun" - Beos meaning bent grass, reeds or rushes, and tun meaning farmstead. Thus we have the farm built for workers to cut and sell reeds to roof thatchers. "Beeston has grown during the last few years from a village into a towngiven over largely to manufacturers. 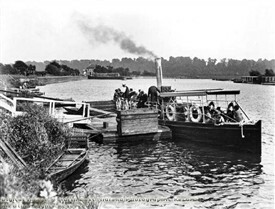 "Excellent boating may be had on the Trent at Beeston, and during the summer months a large number of houseboats take up their stations in this reach of the river".